In 2013, two years after the first anti-government protests began in Dara’a, the Syrian Arab Army (SAA) was estimated to have lost half of its pre-war strength to defections and combat deaths.1.Lister, Charles, Nelson, Dominic. “All the President’s Militias: Assad’s Militiafication of Syria” Middle East Institute (Dec. 2017) By the end of 2017, analysts put the number of offensive-capable fighters in the SAA at no more than 25,000.2.Lister, Charles, Nelson, Dominic. “All the President’s Militias: Assad’s Militiafication of Syria” Middle East Institute (Dec. 2017) In order to ameliorate this manpower shortage, Damascus has pursued three strategies. First, it enabled the proliferation of pro-government militias through the passage of 2013’s Legislative Decree 55 which allowed for contracting private companies to protect gas and oil infrastructure.3.“Syria’s Desert Hawks and the Loyalist Response to ISIS” : Small Wars Journal Some militias were affiliated with established governmental bodies, such as the Air Intelligence-affiliated Tiger Forces from Hama. Other groups formed from wealthy businessmen connected to the government, like the Jaber brothers’ Republican Guard-affiliated Desert Hawks.4.“Syria’s Desert Hawks and the Loyalist Response to ISIS” : Small Wars Journal Many more militias mobilized within key loyalist communities, like the Aleppo Palestinian Liwa al-Quds and Damascus Palestinian PFLP-GC. Second, Assad’s allies sent large numbers of foreign fighters to bolster the frontlines, with Hezbollah officially entering the war in early 2013 alongside thousands of IRGC-linked Afghan and Pakistani men, while Iraqi Shia militias had been fighting in Syria since 2012.5.“Hezbollah gambles all in Syria” : Reuters6.“Afghan Fatemiyoun Division operative killed near US base in southeastern Syria” : Long War Journal7.Smyth, Philip. “Iraqi Shiite Foreign Fighters on the Rise Again in Syria” The Washington Institute (May 2015) Both of these strategies are well documented. The third and less discussed strategy is the conscription of former rebels into the SAA and affiliated militias.8.Adleh, Fadi, Favier, Agnes. “Local Reconciliation Agreements in Syria: A Non-Starter for Peacebuilding” EUI Publications (June 2017)9.“In A Syria Suburb Cleared of Rebels, A Gradual Return to Everyday Life” : NPR These men, locals from former rebel towns that underwent reconciliation agreements with the government, have taken on an increasingly prominent role among some frontline units. This article combines one year’s worth of martyrdom reports with an interview of a pro-government Syrian for a detailed analysis of the Syrian government’s reliance on reconciled rebels in offensive operations. Sixty-seven pro-government deaths were reported over the past year from specific towns in the Quneitra governorate. Of these, thirty-four came from the crucial pro-government Druze town of Hader while at least eight were of former rebels from Khan Arnaba. In other words, 12% of the reported pro-government deaths with identifiable hometowns in Quneitra between March 20, 2017 and March 20, 2018 were reconciled rebels. The town of Khan Arnaba, which reconciled in May 2016, lost at least 176 locals and displaced residents due to combat between May 2016 and September 2017, as seen in the Facebook post below. 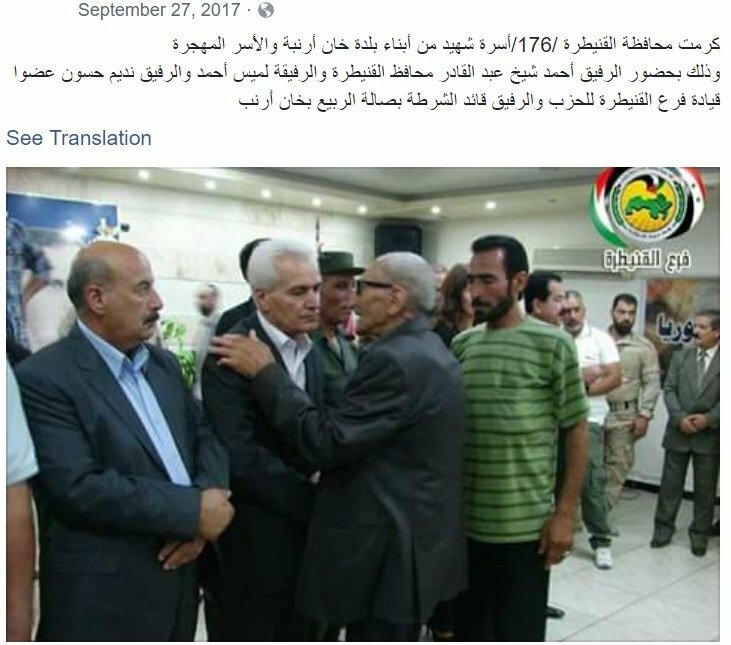 Quneitra Governor Abdul Qadir and members of the region’s Ba’ath Party and town police meet with the families of 176 martyrs from the reconciled town of Khan Arnaba. The first reconciliation deal of the Syrian Civil War occurred in the city of Homs in 2014.10.“Timeline: Syria’s 13 people evacuation deals” : al-Jazeera However, it was not until Decree 15 passed in July 2016 that reconciliation became an official part of the Syrian government’s strategy to win the war.11.Ezzi, Mazen. “How the Syrian Regime is Using the Mask of ‘Reconciliation’ to Destroy Opposition Institutions” Chatham House (June 2017) Since then, scores of rebel-held towns and neighborhoods have been forced to reconcile with Damascus. According to the interviewee, who wishes to remain anonymous for security purposes, reconciled rebels from the southern governorates of Damascus, Dara’a, and Quneitra have largely been conscripted into SAA units. Meanwhile, reconciled rebels from the governorates of Homs and Hama have generally remained as local defense militias. This difference partly comes from the fact that Hama and Homs rebels reconciled much earlier in the war when government manpower shortages were not as severe, while many Damascus, Dara’a, and Quneitra rebels reconciled later in 2016 and 2017. On the other hand, many of the southern rebels claim that they first joined the FSA due to maltreatment by the army, a more manageable motivation than the hardliners in the north. Despite this, loyalist fighters hold immense animosity towards these ex-rebels. In one example, an ex-rebel group from Quneitra called ‘Ashirah al-Musalaha is widely referred to as the “Daesh Hawks” within NDF circles. These former rebels have zero connection or similarity to the ideology of the Islamic State (ISIS), which ‘Daesh’ is a derogatory term for. Instead, they are organized through the Golan Regiment and Quneitra Hawks, both of which include ex-rebels, and fight under the command of the 9th Division. The ‘Ashirah al-Musalaha assisted the government in breaking the rebel siege of the vehicle management base in Harasta, Damascus, in January 2018 and lost at least one member. The martyrdom announcement for Bahaa Mousa of the “Reconciliation Clan” killed in Harasta, Damascus on March 5, 2018. Ex-rebels have played leading roles in several offensive and defensive operations over the past year. In the aforementioned Harasta operation, former rebels took frontline positions as members of the 9th Division and Qalamoun Shield Forces (QSF) stopping and ultimately reversing rebel gains. QSF also played a prominent role in the government’s late 2017 Hama and Idlib offensives and was crucial in the government defense of the town of Qomhana during the rebel offensive in North Hama in March 2017 12.Based on martyrdom reports and QSF claims. Majority of government deaths reported in Qomhana in the three days around which the rebels threatened the city came from QSF, which arrived on the front on the same day as the main rebel attack. https://twitter.com/JohnArterbury/status/845440827199512576. Other ex-rebels serve in the 58th Brigade as ‘elite’ ATGM hunters, taking advantage of their extensive experience with western-supplied ATGMs used against government armor. The 58th Brigade was previously affiliated with the 1st Division but is now also under the command of the 9th Division. The 58th Brigade held frontline positions in the Harasta battle and later sent men to counter the brutal ISIS attack in the southern Damascus neighborhood of Qadem. Incidentally, in Qadem the ex-rebels of the 58th Brigade fought alongside two mukhabarat units based out of nearby detention centers. Many former rebels from the Dara’a town of Ghabaghib now fight in the 7th Division, which took a prominent role in October 2017 in the Beit Jin offensive, losing at least 14 men, and participated in the March 2018 East Ghouta offensive, losing a Colonel. A small contingent of Dara’a rebels have been incorporated into the 1st Division, which helped lead the assault on ISIS-held Mayadin, located 44 kilometres southeast of Deir Ez Zor, in October 2017 and also contributed to the counter attack in Qadem. The ex-rebel Hermon Regiment was established in the beginning of 2017 as part of the reconciliation deal with four rebel towns nearby the Beit Jinn pocket in southern Damascus.13.“Beit Jann: Myths and Reality” : Aymenn Jawad al-Tamimi When Beit Jinn itself reconciled at the end of 2017, many of its rebel groups also joined the Hermon Regiment. 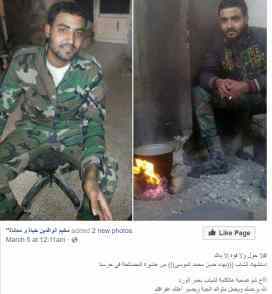 Three men from this unit died in the government’s East Ghouta offensive on March 12, 2018. A year and half earlier, the town of Khan Arnabah reconciled with Damascus and many of its Free Syrian Army (FSA) fighters formed a new pro-government militia known as the Golan Regiment.14.A transcript of “Inside Assad’s Syria” from the PBS Frontline organisation reveals this information. One of its commanders, Majd Heimoud, served in the SAA in 2011 prior to defecting to the FSA.15.A transcript of “Inside Assad’s Syria” from the PBS Frontline organisation reveals this information. Heimoud was killed by an IED in June 2017. In the thirteen months between reconciling and his death, he and the Golan Regiment had fought in Palmyra, Homs, Jobar, Damascus, in the Hama countryside, and, according to the interviewee, have become the primary pro-government fighters in Quneitra. Former rebels from Quneitra, like those in the Golan Regiment, have been undergoing reconciliation since 2015. Reportedly, Quneitra rebels first join the local Golan Regiment or Quneitra Hawks where they are then gradually co-opted into SAA units across the country. In Dara’a, however, reconciled rebels are placed under the command of the Military Intelligence Directorate in select training camps in the governorate. For a time, QSF was also affiliated with the SAA’s 3rd Division. However, in May 2016 the group announced its split from the 3rd Division while retaining its affiliation with Republican Guard, Air Intelligence, and Military Intelligence Branch 216.18.“Quwat Dir’ al-Qalamoun: Shifting Militia Links” : Aymenn Jawad al-Tamimi Three QSF units remained affiliated with the 3rd Division: al-Jabba, al-Bureij, and al-Tawani, named after the towns they recruited from. Al-Jabba, which had previously reconciled with the government, had at least six reported deaths fighting in North and East Hama. Three men from al-Bureij and two men from al-Tawani died last year in East Hama and North Hama, respectively. As Tamimi reports, QSF has engaged in widespread recruitment within reconciled towns in the Qalamoun since its inception, but he is unable to state exactly how much of QSF are former rebels.19.“Quwat Dir’ al-Qalamoun: Shifting Militia Links” : Aymenn Jawad al-Tamimi Yet martyrdom reports collected over the past year can provide a semi-accurate view of how extensively ex-rebels have been incorporated into QSF. Between March 20, 2017 and March 6, 2018, loyalist Facebook pages reported 109 QSF combat deaths. 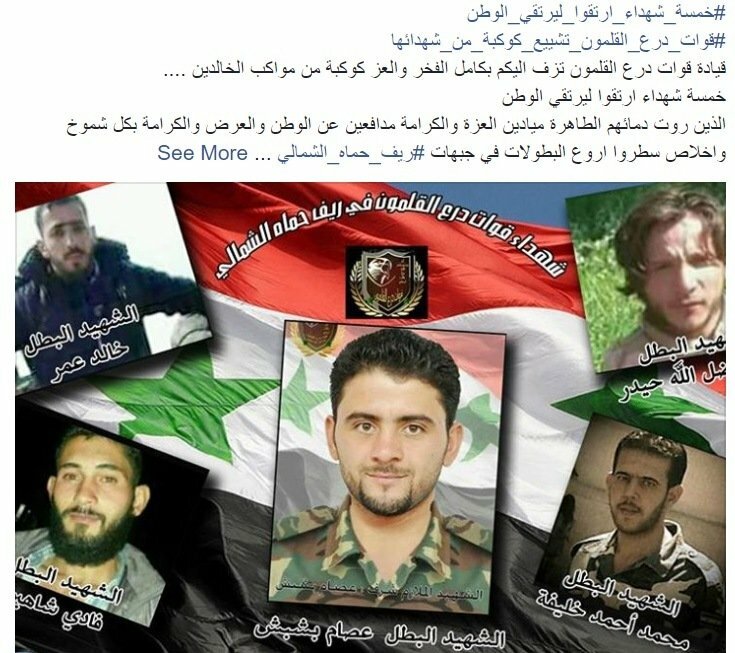 These men died in North Hama and Damascus fighting against Syrian opposition forces and in East Hama, Palmyra, and Deir Ez Zor fighting ISIS. Between 64% and 74% of the reported deaths were reconciled rebels. Five fighters from the Qalamoun Shield Forces killed in Qomhana, Hama on March 26, 2017. At least four are reconciled rebels from Jebbah and Deir Atiyah. The use of reconciled rebels as front line troops against their former neighbors and allies is just another sad chapter in the story of a nation torn apart. 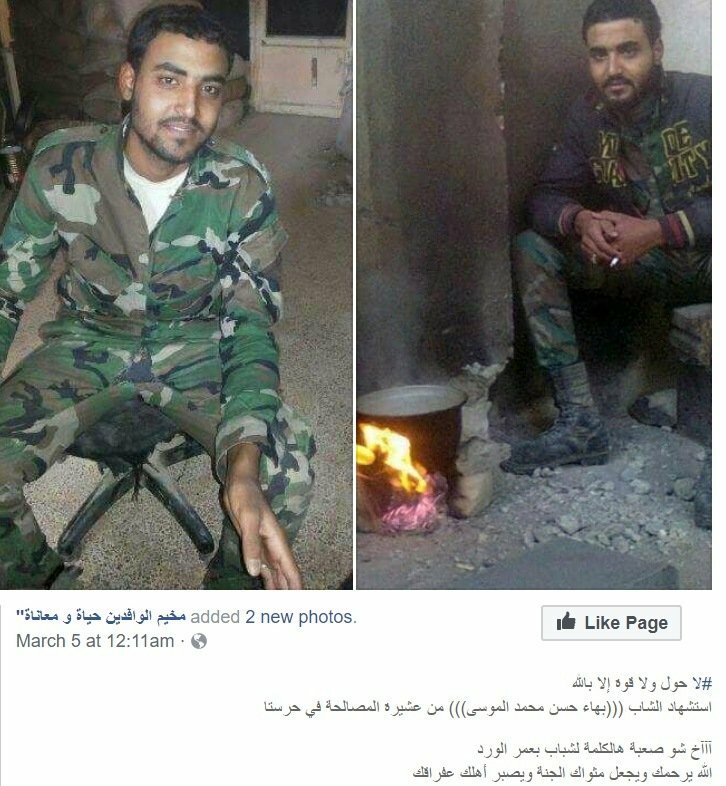 While conscripting reconciled rebels has proved crucial to addressing the government’s manpower shortages, these men – who now give their lives to help secure Assad’s hold on power – will forever be viewed as pariahs and traitors by loyalist Syrians simply because of their political beliefs. In a state where the families of loyalist fighters are threatened for not being loyal enough to the government, there is little hope for the full reintegration of opposition Syrians – no matter how much blood they spill for Damascus. 14, 15. ↑ A transcript of “Inside Assad’s Syria” from the PBS Frontline organisation reveals this information.